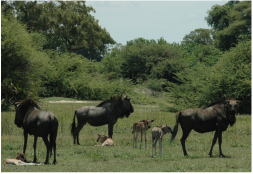 Our multi-disciplinary team includes PIs, students and collaborators, allowing us to investigate a wide range of topics critical to furthering our understanding of Botswana's herbivore populations. Two researchers form the core of Botswana Herbivore Research; Dr Hattie Bartlam-Brooks and Dr Emily Bennitt. Both have worked in Botswana for many years, initially focusing on single species studies on zebra and buffalo, before expanding their work to encompass many of the ungulate species and species assemblages found in Botswana. We also work with a wide range of ecologists, geographers, physiologists and sociologists, allowing us to tackle questions that require multi-disciplinary input.